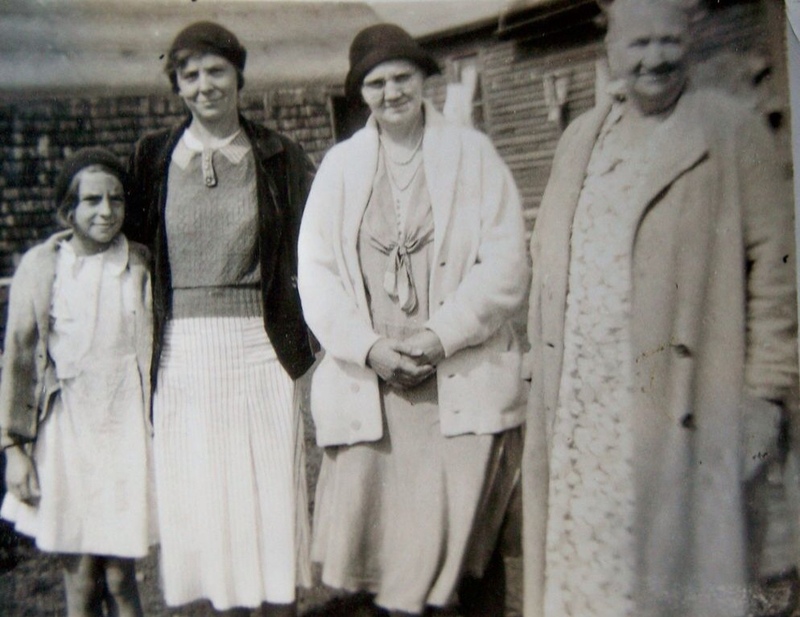 Recently I've been pondering about the generations of women in my family as I sit down to sew or work in my garden or pull out my Great Gram's food grinder to make green tomato relish. I feel a comradery and close connection with those who have gone on before me. My Great Gram, Gram and Momma all lived through the Great Depression. They learned to make due with very little and still enjoy life. I love hearing the stories about my Momma and her dad walking the railroad tracks picking wild asparagus. When the center of sheets wore out they were cut down the middle and the edges of the sheet became the new middle! While walking home from the store, my Momma found a twenty dollar bill on the ground. After trying to find the rightful owner, the money was used for some chicken wire and hens. I have a photo of my 87 year old Momma, my two sisters, and myself on the desk I sit at when I sew. 2,000 miles physically separate us but we share a commonality that propels us to go the extra mile when it comes to our families. Case in point: I stayed up until 3 am designing patterns and sewing doll clothes for my grandchildren and aprons for my daughters. Could I have bought them nice gifts? Sure could have! But it was important to me to share myself in the gifts I made them. Getting back to our roots by being productive ties us to past generations. 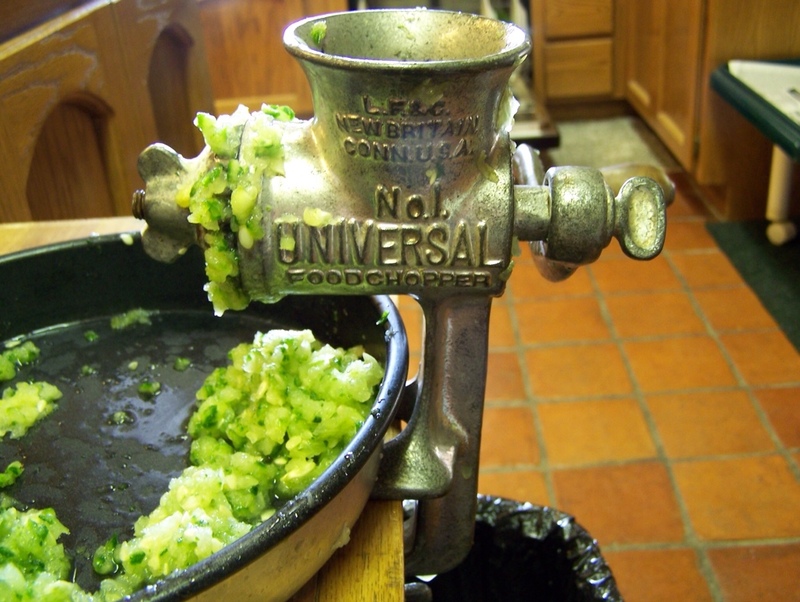 When I am making relish with my granddaughters using my great grams food grinder, I imagine her hands on that smooth, worn, wooden handle. I feel a responsibility to pass on to my daughters (in-law), to my grandchildren, to daughters everywhere the time honored skills of making a home and the many facets that includes. There is such a wonderful sense of pride knowing you did it and the added bonus of being in control of what went into the finished product. Will and I have three wonderful sons. When they married we fully embraced their wives as our precious, long-awaited daughters. One of our daughters is from India, one is from South Korea, and one from the USA. Each one is loved and treasured and brings incredible strengths to our family, as well as, tasty foods from their homelands! The older I get, the more I am truly grateful for family . . . Past, present, and future Generations. 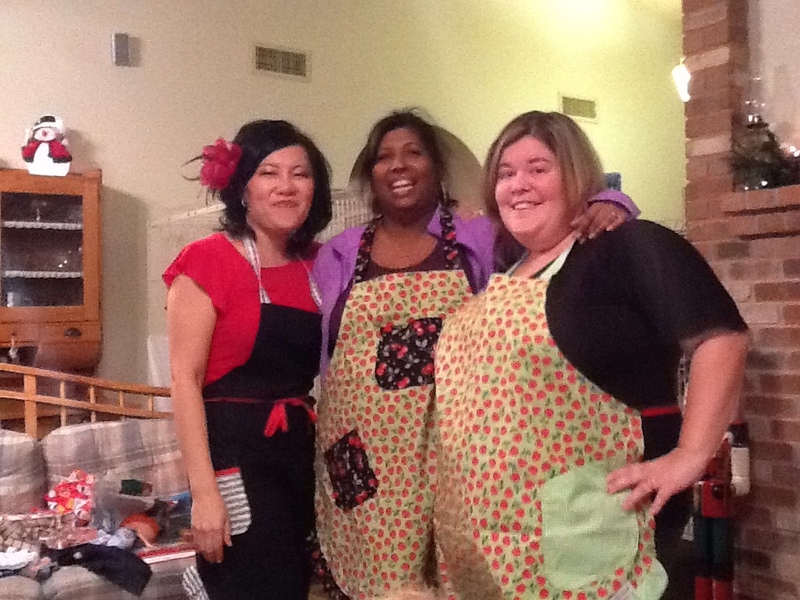 It is exciting to see the passion and love for family and the art of homemaking. There is indeed a treasure in our heritage as women to create a place called, "home" as we grow and learn to express "love" uniquely while honoring where we came from. Loved reading your blog and look forward to more. It was you who taught me how to cook by example and my most favorite cookbook you gave me when I got married and is now very well worn. I remember coming to your house as a newlywed and making cookies from scratch and later having Julie's Cottage Cheese Rolls becoming a tradition in our home for Christmas Eve Celebrations after we left Michigan. Thanks for all the amazing memories. I remember those precious times we shared sitting in my kitchen going through recipes in cookbooks. I think we were a bit younger back then. Did we make those yummy Paul Bunyon Sugar Cookies? It is funny you should ask that, I was just going through some stuff and found that very recipe. Memories are wonderful. Those,cookies,we're pure butter and sugar with a,touch of flour and vanilla, if I remember correctly, I sure did love making those with raisins and a big glass of milk!